The last two weeks I was running around and haven’t spend more than 3 nights at one place. That was tiring. And I couldn’t either find peace at one place nor did I have that feeling of “having arrived”. My next destination was Ubud. And straight away I booked 7 nights at Nyoman Warta Accommodation. Somehow I need to get a rest. And Ubud seemed to be the right place for it. It was dark when my taxi driver brought me from Padangbai to Ubud. I sat with 8 other people in the shuttle bus. When you book a speed boat from Gili Air to Bali, the transport to your next destination is included. It has been a long day and also a busy time since my arrival at Denpasar Airport. In my first week I moved around three times. (Which places I visited you can read here.) For my second week I chose to go from Canggu to Gili air hopefully finding calm and peace. Two things the ocean usually gives me. And it was good to have spent those days on an island. I just got my period arriving on Gili Air. So it was time to slow down. I love to be able to respect my feminine cycle. But now I arrived in Ubud. On my way I was watching the forest and trees passing by, the rushing lights of the scooters and busy traffic. I was back in Bali. But this time I wasn’t troubled by that. Somehow I had a deep feeling of contentment and gratitude. I knew I was driving in the right direction, not only on the road. The morning after I woke up in a kingsized bed, watching the ceiling with yellow stucco. 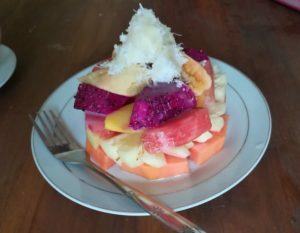 My breakfast was a green banana pancake and literally a tower of a fruit salad with grated coconut on top. I enjoyed that delicious first meal of the day on my little private terrace, first floor, with a view down into the family temple. The good smell of the incenses they light several times a day was flowing into my nose. That was what I was waiting for: finding home. I was raining the complete following week. But it didn’t even bother me. I was enjoying to stay at home or just crossing the street to Sayuri Healing Food to get a cappuccino with cashew nut milk. And sitting there observing the raindrops on the plants in the garden, my creativity (+writing) was coming back. The rare dry moments of the day I used to get to all the 5 yoga studios I was supposed to visit in Ubud. And I saw them all: Yogabarn, Radiantly Alive, Taksu Yoga, Ubud Yoga house and Intuitive flow. Ubud is really a spiritual hub for Yoga and alternative therapies. There’s nothing you can’t find. 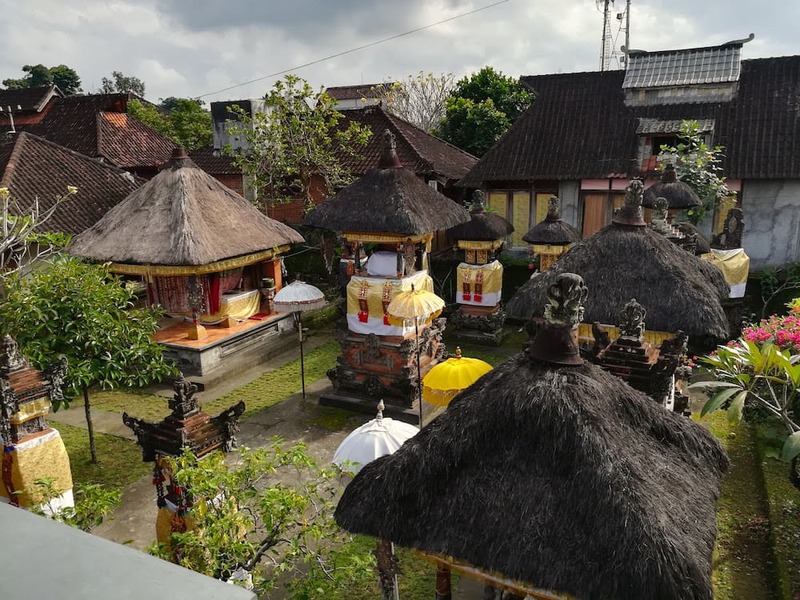 Ubud’s offer couldn’t be more diverse: balinese healing, osteopathy, reiki, acupuncture, ayurveda, sound healing, shamanic astrology, ecstatic dance, rebirthing, and of course – lots of Yoga. The variety of yoga classes and styles was huge. I tried women’s balance with Tina Nance at Yogabarn, Hatha Flow with balinese Agung at Taksu Yoga and my personal favorite with Linda: Pranala Yoga at Intuitive Flow. In Radiantly Alive I was able to try three classes: Roll and Release, Sky Yoga and a great Vinyasa Morning Flow, taught with a high level of responsibility by the Peruvian owner Jasmine. The time I was not sitting in Sayuri healing food or Mama’s Warung (my daily place for lunch and dinner), I spend at home, at Nyoman Warta’s Homestay. 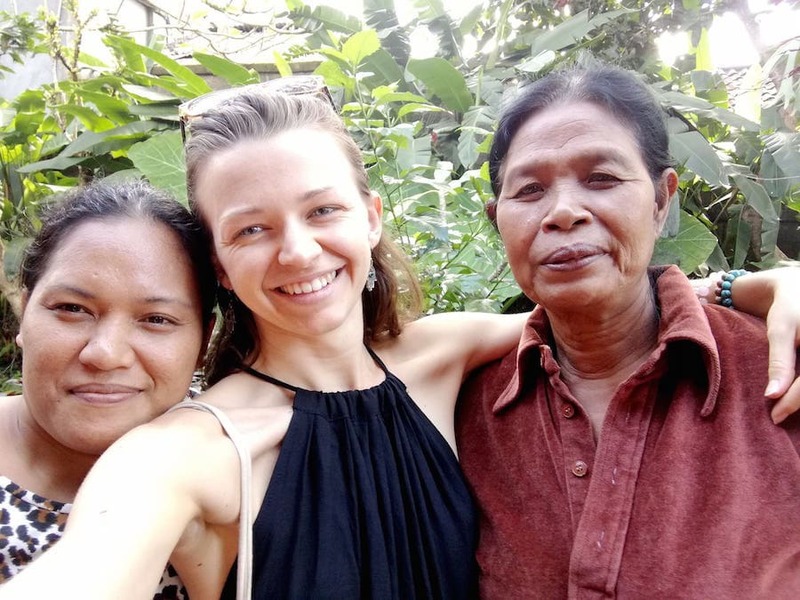 I talked a lot to Kadek and her family exchanging cultural habits and life stories. Balinese are in general overwhelming friendly and always smiling. To meditate, only you must smile. Smile with face, smile with mind, and good energy will come to you and clean away dirty energy. Even smile in your liver. After sharing hours of talking, family stories and of course our Facebook profiles, Kadek and me became friends. She gave me many Insights about her history and culture. And also about the story of their homestay, founded by her dad Nyoman 26 years ago. Nyoman started this business in 1991 – with 3 rooms. They were the first homestay in the street. 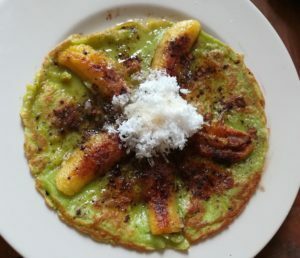 His wife Ibu Agung got famous with her green banana pancake and the generous fruit salad. And more and more travelers enjoyed the kindness of the family. Business was going great and they thought about expanding. So they asked the other part of the family to join Nyoman’s idea and make the whole family complex a place where foreigners and locals can meet and feel at home. Today they have 16 rooms, and a high occupancy. But success hasn’t influenced their mind and philosophy. It’s about sharing and caring. Feeling at home and being in a family is more important than building a luxurious but apersonal and faceless hotel. But Putu won’t need to wait for much longer. In the next two years his daddy plans to build a second place in Ubud. Integrating the good food of his mother and a swimming pool. And then coming back forever. Ibu Agung (Kadek’s mum) and Desak are the beating heart of Nyoman Warta Accomodation. They take care of every guests wellbeing, cooking this outstanding breakfast and providing the guests with everything they need. Desak is so friendly, always smiling and super polite. She served me breakfast every day and didn’t hesitate to bring me a second cup of tea. The family at Nyoman Warta really made my stay. My planned 7 nights became 9 and after my stay at the Ashram I returned for two more nights. They didn’t only give me a cozy and safe place to stay but a family at the other end of the world. 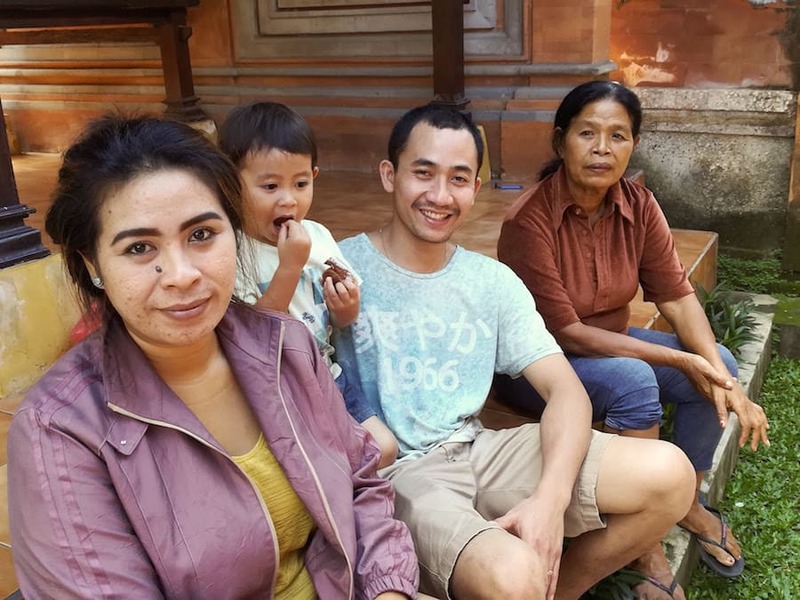 Now I have a balinese family in Ubud when I come back. Thank you so much for your love and warm heart, your help and openness. I want to see you in Europe. You have a family here too.